Last February, I attended a Startup Weekend in Provo, Utah not really knowing what to expect. I adapted quickly to the collaborative environment though, and despite the fact that I was there to serve as a mentor rather than a competitor, I got caught up in the startup fever, formed a team on the spot and we ended up winning the event. That spur of the moment decision to participate was born of two things; a great idea and the confidence in my ability to sell based on extensive pitching experience. Making that decision also changed the course of my life. Just three months after winning Startup Weekend, my entrepreneurial dreams are coming true as my startup, QuotaDeck.com, is now a member of Techstars' Boulder class of 2014. Anyone can attend a Startup Weekend, but if you plan to win the event first become an expert in a specific topic, or niche, because that is where real value is created. I had been invited to Startup Weekend by the organizers because of my expertise in business-to-business sales. 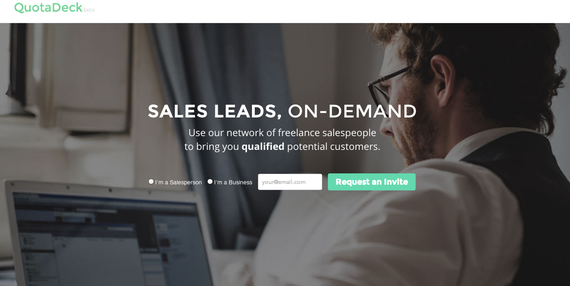 I have been in the sales game for a long time; having created my last company, LaunchLeads.com from scratch, and bootstrapping it to over million dollars in profitable yearly revenue. That experience and expertise gave me immediate respect and credibility in front of the Startup Weekend community. You can't fake expertise. Gaining it is the result of hard work and success. In some cases that means you'll need to get a job and work to build out that credibility before a community like Startup Weekend accepts and invites you to serve as a mentor. Other times it just means you need to be more vocal about your expertise, because the community might not know your history. And in some cases you'll need to do both; build out your experience and be vocal about your success. QuotaDeck.com took first place at Startup Weekend, not because we had the biggest or most experienced team (in fact, we had the smallest team), but because we created a real business idea that a wide range of customers would actually pay for. Most of the other Startup Weekend team's ideas and products were focused on consumer mobile apps, which are typically fun and creative. At the end of the weekend, however, those apps lost out because the majority of them were not built to generate revenue and lacked a strong potential business model. That being said, we were incredibly friendly with the other teams, helping them to "like" us and get excited about our progress and later success. Rather than only thinking of Startup Weekend as a competition, we jumped in to help other teams out and in return, we received a ton of help and support, and even praise from the startup community. We knew after that weekend our next step was to grow our product and team, and to look for an accelerator to partner with in our path to finding our product and market fit. Before we could apply, however, we were approached by Startup Next, a seven-week mentor-driven program offered by UP Global, the same organization that runs Startup Weekend. The goal of the program is to mentor startups like ours and help them gain easier entrance into an accelerator. I was looking for mentorship and more people to help out on this idea, so when the offer came to participate I jumped at the opportunity. Strategically, it simply makes more sense to learn what the accelerators are looking for first, prior to applying. Startup Next helped our team validate the business and model, and the program held us accountable. It also exposed QuotaDeck.com to new mentors from the community and gave us the chance to pitch, present, and practice in a helpful manner. It was stressful and hard at times, but it helped us focus our mindset and the team got stronger. The Startup Next program is half of the length of time of most accelerator programs, so it is a great opportunity to see if you and the business have what it takes. You can use the program as a chance to prove it to yourself and others. It also helped our team narrow things down, generate sales and interview calls, and meetings with potential investors. And shortly after the program ended, we applied to Techstars, and with the insights gained during Startup Next, were accepted into one of the most well-known and prestigious accelerators. 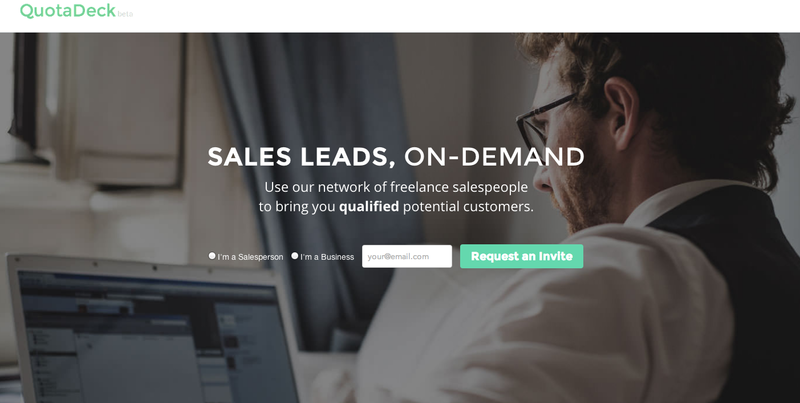 We are now actually building out our online platform for freelance salespeople that brings "Sales Leads, On Demand", almost like a Google Adwords, but instead of businesses paying for clicks generated online, they are paying for sales leads, generated by freelance salespeople. The future is bright in large part due to my leap of faith while attending Startup Weekend last February, QuotaDeck's experience and expertise in the sales arena, and because we now can see the light at the end of the tunnel! Brandt 'Bubba' Page is the founder and CEO of QuotaDeck.com. Prior to founding QuotaDeck, Bubba founded LaunchLeads.com in 2009, and was named Emerging Executive of the Year 2009 by the Utah Technology Council.